Tag Archive for "Uluru- Ayers Rock"
Australia’s outback is located in the heart of the Northern Territory. This mystical region draws visitors from around the world to its inspiring and otherworldly desert landscape. The red expanse of Uluru, the natural and cultural wonders of Kakadu National Park and the tropical backdrop of Darwin are just a few of the captivating sights in the outback. We’ve rounded up seven amazing stops in this vast territory filled with natural beauty and activities for adventure seekers & leisure travelers alike. Uluru, also known as Ayers Rock, is a world-renowned destination for getting swept up in the majesty of Australia’s outback. Located a few hours away from Alice Springs, this natural wonder tantalizes visitors with its powerful presence and subtly changing hues. There’s no better way to start your day off than on a morning hike around the base of Uluru, catching the glow of the sunrise brighten the reds and oranges of the rock. Then board a coach to Kuniya Piti where you’ll learn about the rich, sacred culture of the local Anangu people. See incredible aboriginal rock art in the caves throughout the area. A scenic helicopter tour gives tourists a bird’s eye view of the magnificent desert. Witness the breathtaking views found only in the Red Centre, including the amazing domes of Kata Tjuta and the Mutijulu waterhole. Spend your night under the stars and witness the desert illuminate on a Field of Light tour. Internationally-acclaimed artist Bruce Munro’s Field of Light art installation has become a global phenomenon with over 50,000 solar-powered stems crowned with frosted-glass spheres, lighting up as night falls. This particular piece, named Tili Wiru Tjuta Nyakutjaku or ‘looking at lots of beautiful lights’ in local Pitjantjatjara language, creates a glittering field of blue, violet and ochre hues as far as the eye can see. Enjoy this splendid setting with wine and canapes, or start your morning with a sunrise viewing. Alice Springs is the perfect base for an outback adventure. This remote town is the gateway to major natural wonders of the outback. Just a few minutes away are the MacDonnell Ranges, a popular destination for adventure seekers. Natural beauty awaits in this magnificent scenery, housing famous landmarks including the Ochre Pits and Ormiston Gorge. Enjoy a day trip with a guided tour through the West MacDonnell ranges or stay overnight at one of the many camping spots available. Alice Springs is also home to the adorable and famous Kangaroo Sanctuary (get ready for cuteness overload on their Instagram). Take a bus to the sanctuary where you’ll meet owner Brolga and hear the story and the passion behind keeping these beautiful animals thriving. You can also experience the outback from a bird’s eye view on an early morning hot air balloon ride. See local wildlife such as kangaroos and wallabies below you as you silently glide over the outback. For those seeking more thrills, go on a 4WD cattle station tour below the MacDonell Ranges. Escape to the oldest working cattle station in the Northern Territory as you ride across the ranch through bush tracks and local landscape on an ATV quad bike. You and no more than 9 other riders get to see mountain ranges and wildlife up close. No riding experience required! As the vibrant capital of Northern Territory, Darwin offers a cool blend of laid-back tropics and exciting outback wetlands. Tune in to the chilled out vibes at one of many al fresco restaurants or splash into the wave pool in the Waterfront Precinct. Stay out for the famous Darwin sunsets, casting lingering oranges and reds across a deep blue sky. Just a short one hour’s trip away from Darwin you’ll find Litchfield National Park, home to some of the most breathtaking waterfalls in the Northern Territory. These spring fed falls attract native wildlife including wallabies, kangaroos, flying foxes and dingoes. Stay dry and enjoy the nature that surrounds you on guided tours to crystal clear waterholes beneath its falls or explore the sandstone relics of the Lost City on a 4WD. With several waterfalls and rock pools, all you need is a picnic lunch and your swim suit for a perfect day out. The natural beauty and tantalizing water clarity is irresistible. Swim out to the cascading Wangi Falls or dive into the clear flowing water of the tiered rock pools at Buley Rockhole. It wouldn’t be an Australian experience without a few crocodiles! A saltwater crocodile cruise on the Adelaide River lets you see these creatures up close as your guide entices the crocs to jump out of the water. Feeling adventurous? Why not take a dive in Crocosaurus Cove which submerges you in the water alongside the crocodiles! This gem in the heart of Darwin boasts an impressive collection of reptiles with the once-in-a-lifetime opportunity to swim with crocodiles in the Cage of Death. If you’re looking for a more laid back nature experience, stop by Mary River National Park. Trek through the wetlands where you can see wildlife in its natural habitat. Lush landscape provides a perfect escape on your way to Kakadu. Kakadu, Australia’s largest national park, is home to rugged escarpments, lush rainforest, ancient rock art galleries and stunning waterfalls. Set out to Jim Jim Falls and Twin Falls on a 4WD or on a small group tour and dive into their deep plunge pools framed by magnificent cliffs. Relax on the white sand and dip into the cool water of Jim Jim Falls or take a scenic flight above Twin Falls, cascading down sheer rock cliffs. Explore other swimming holes such as the Gunlom Falls plunge pool or the clear emerald waters of Maguk (Barramundie Gorge) where you can hike to the top of the falls and relax in the top pools. With Aboriginal rock art dating back 20,000 years, a stop at Ubirr and Noulangie art sites is a must. See a striking depiction of the extinct Tasmanian tiger, or thylacine, as well as paintings of fish, turtles, goanna and other important food animals. Marvel at the depictions of creation ancestors on the rock walls of Burrungkuy (Nourlangie), including Namarrgon, the Lightning Man. Keep an eye out for native wildlife on a Yellow Water Billabong Cruise. As Kakadu boasts Australia’s most diverse bird population, this is a great way for twitchers looking to tick a few birds off their list and even see a crocodile or two! 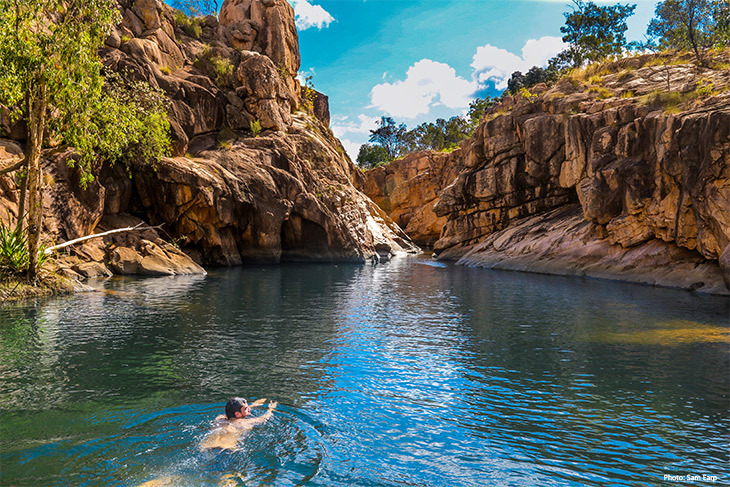 Home to thirteen stunning gorges and cascading waterfalls, Katherine Gorge & Notmiluk National Park calls out to many who want to experience the tropical setting of Australia. Glide along the deep blue water, as your tour guide describes the lush lands in the comfort of a relaxing boat ride. Love to kayak or canoe? Grab your equipment and push yourself out in the river bank to immerse yourself in the natural beauty that surrounds you. Get an up close view of Katherine’s stunning landscape that is sure to make you fall in love with the Northern Territory. For nature lovers, Daly River provides a promising destination for camping and fishing. Take a dip in the swimming holes, experience the breathtaking gorges, go fishing for the plentiful barramundi and enjoy your catch over a fire as you camp alongside the wildlife. Tennant Creek offers visitors a cultural escape to the real outback. Experience the gold rush era of Australia on an underground tour of Battery Hill Mining Centre. You can even try your hand at fossicking to take home your own gold! Love hearing about local history? Immerse yourself in Aboriginal culture as you listen to stories of ‘Nyinkka’, the spiky tailed Goanna that is responsible for shaping Tennant Creek and the ancient myth that surrounds Karlu Karlu/Devils Marbles, the mysterious rock formations in the area. The rugged beauty of Barkly Region is home to some of Australia oldest cattle stations. Plan your trip in June and experience a bush race and rodeo event at Brunette Downs Races. With its white sandy beaches and clear Arafura Sea, the paradise setting of East Arnhmen land is a gorgeous escape into the wilderness. After a stroll on the gorgeous beach, visit art and craft centers to learn from the locals. West Arnhem houses Gunbalanya, a large Aboriginal town surrounded by spectacular rock formations. See native artists work and purchase artwork and crafts at the Injalak Art and Craft Centre. Experience how the indigenous people live and take a piece of history home with you. Ready for an Outback Adventure? Whether it’s your first trip or your 5th, there’s never been a better time to plan a trip to Australia. The awe-inspiring Northern Territory, one of the best places to visit in Australia, is calling out to you! Give our destination experts a call 1-888-359-2877 (Mon-Fri 8:30am -5:00pm Central US) and experience Australia’s Outback for yourself. Uluru, also known as Ayer’s Rock, is one of the most important historical sites in Australia. The Anangu people, a group of Aboriginal Australians, revere Uluru as a sacred, holy site. They believe it is evidence of the creation of their culture by ancestral beings. Aboriginal Australian’s lived off the land in Uluru and all of Australia for more than 60,000 years before European settlement. In fact, they are even said to be the world’s oldest human civilization. The immense monolith of red stone shoots up out of the Earth, shouting its significance across the desert. The deep red sandstone and surrounding clay look like some kind of Martian landscape. It’s no wonder they call it “the Red Center”. Aside from the amazing historical significance of the site, there are plenty of things to do in Uluru that make it a must-visit destination in Australia. Uluru’s immensity is almost hard to comprehend in photos. For instance, did you know that this tremendous “land-iceberg” is taller than the Eiffel Tower? At nearly 1,200 feet tall, Uluru is 3 times taller than the Great Pyramid in Egypt. It’s also about the same height as the Empire State Building! If you really want to appreciate Uluru’s size and massive footprint, set aside about 4 hours for a walking tour. That’s how long it will take you to walk around the base of the giant rock. Along the way you’ll see unique plant life, diverse wildlife and geological features that make up this important site. But be sure to stick to the base walk. Though Uluru’s peak is a tempting destination for the avid mountaineer, out of respect for the Anangu people it is not advised to climb to the top. Dine under the stars with an amazing desert night dinner. The Sounds of Silence dinner is an Aussie Hall-of-Fame experience that wines and dines you in the heart of Uluru National Park. You’ll start the evening off with light appetizers and your choice of an array of fine Australian wine and beer. As the sun sets, you’ll see the Red Center’s colors morph with the light, from bright reds to deep purples. Darkness envelopes the desert and the faint light of thousands of stars begins to twinkle, a bush-tucker inspired buffet dinner is served. The buffet incorporates local and indigenous cuisine and native bush ingredients. Then, an expert guide will take you on a historical journey of the southern night sky. See the constellations of the zodiac, the prominent star cluster of the Milky Way, other planets and their moons and more. The Sounds of Silence is part al-fresco dinner under the stars, part astronomical stargazing tour and all-around amazing experience. For more incredible memories of Uluru National Park, add on a visit to the “Field of Light” art-installation. Famed artist Bruce Munro was commissioned to bring his luminary works of thousands of solar-powered twinkling lights to Uluru. For this installation, Munro upped the intensity of his normal installations to match the grandiose nature of Uluru. You’ll walk through the dense, sprawling web of soft lights that blanket the desert. With thousands of stars visible overhead and the thousands of lights that turn the desert in to a galaxy of its own, the Field of Light is a sensory experience you’ll never forget. The Field of Light is only running through April 2018, so if you want to see this web of woven light that blankets the desert (and trust us, you do!) – act fast! While climbing Uluru is not explicitly prohibited, or against Australian law, it is very much frowned upon and discouraged by the Anangu people as well as most Aussie locals. Since Uluru is a holy site for Aboriginal people, it is seen as highly disrespectful to walk on or climb. However, there are ways to see Uluru from all angles, including the very peak. A scenic helicopter ride around the Red Center is one of the best ways to observe the area and see the 1,200 foot peak. You’ll hop aboard with an expert pilot as you are flown around Uluru National Park. See the numerous, massive domes that make up the Olgas, just south of Alice Springs. A scenic helicopter ride is one of the best ways to appreciate Uluru and the whole Uluru-Kata Tjuta National Park area. Where would you say the largest population of camels live? Morocco? Saudi Arabia? Oddly enough, the answer is Australia! Though camels are not indigenous to Australia, they were imported in the 19th century for transportation and field work. Since then, their populations have exploded and more than 700,000 live in Australia. Mount up on a camel for an amazing ride in the Australian outback. Your camel train will take you around the Uluru National Park area where you will witness the sunset and the changing colors of the Red Center. The Sunset Camel Ride takes you off the beaten path, away from the crowds of tourists at Uluru. Listen close as your camel pack leader regales you with informative and interesting stories about Uluru’s plants, animals and history. This is the most unique way to see Uluru National Park and an experience you’ll never forget. Stargazing in most cities just isn’t what it used to be. With always-on street lights, car headlights and densely populated urban areas, light pollution washes out up to 90% of visible stars in the sky. If you’ve never been in the remote back-country and looked at the stars, you might think that the Milky Way is just something we can see with telescopes or in pictures. The Uluru National Park area is one of the most remote and darkest sites in the world. The lack of light pollution makes it an incredible spot for stargazing. Even before the sun completely sets, the twinkle of astral lights begins to blanket the sky. Once pure nightfall hits, the sky is awash in star clusters, constellations, planets and moons. Go out with an astro-tour group and you’ll have the added benefit of binoculars, telescopes and an expert astronomer guiding you through the night sky. Looking to make your visit extra special? Longitude 131 is a luxury destination at the gateway of Uluru National Park. Experience the rugged outdoors of the outback during the day. Then, come home to a world-class, full-service accommodation at night. Each luxury lodge is eco-friendly, spacious and feature huge floor to ceiling windows for epic views of the outback. Dine on five-star cuisine and premium wine and drinks. You can also take part in exclusive small-group tours for guests. Longitude 131 is the perfect accommodation for couples. Celebrate your anniversary, honeymoon or other special occasion in one of the most unique destinations in the world. You’ll want to make the extra trip out to see Uluru and Uluru National Park. Since Australia is such a large country, getting out to Uluru requires a bit of planning. We’ll get you there without a hitch. Don’t leave anything to chance in this once in a lifetime cultural journey. Uluru has been described as breathtaking in it’s beauty and moving in its cultural significance – it truly can’t be missed! When visiting the Red Centre & Uluru, you’ll being staying at Yulara (Ayer’s Rock Resort), a collection of hotels and resorts that cater to different budgets and tastes, all conveniently located on one property. The best tip we can give you is to try the restaurants located in other hotels. Don’t just stick to the options located in your particular hotel. There’s even a free shuttle that will take you around to the location of your choice. Honestly, the experience is a bit like being on a cruise ship surrounded by sand, except nothing is included. But it’s actually still pretty incredible. The resort is in the middle of a desert with few resources close by but the staff does an amazing job transporting in fresh meats and produce. Even the seafood is surprisingly fresh! Additionally, Ayers Rock has been gradually upgrading the range of experiences available and there are a few that really stand out. Altogether there are about 15 restaurants and bars and 3-4 dining experiences. Based on client feedback and our own experiences, we have highlighted 8 of our favorites below. This four and a half hour dining experience easily tops the list. It’s going to be the “must-do” experience of 2016 and the first 3 months of 2017. Why? Because it’s an amazing once-in-a-lifetime opportunity that will only be possible from April 2016 until the end of March 2017! The Field of Light is an art installation by internationally acclaimed artist Bruce Munro. It’s an installation with over 50,000 slender stems crowned with frosted-glass spheres that will illuminate as darkness falls over Australia’s red heart. This dining experience uses the Field of Light and resplendent desert sunset as a backdrop for one incredible dining experience. You’ll start by enjoying canapés and chilled sparkling wine as the sun sets, creating majestic views of Uluru. The darkness will gradually fall while thousands of glass spheres gently sparkle as you enjoy a special three-course bush tucker inspired menu. You’ll enjoy a didgeridoo performance and then take a walk within the pathways of the Field of Light. You’ll return to a sweet treat and hot chocolate or port before you head back to your hotel. Tali Wiru, similar to the popular ‘Sounds of Silence’ dinner, is on the higher end of luxury and exclusivity. The name, Tali Wiru, which means ‘beautiful’ dune’ in the local language of Anangu. It perfectly describes the magnificent setting overlooking Ayers Rock (Uluru) in one direction and Kata Tjuta (the Olgas) in the other. Choose this experience and you’ll be transferred from your hotel to the remote sand dune by an Aboriginal guide. You’ll walk up the dune and be greeted by Uluru, almost black against the darkening sky, and the rhythmic humming of a didgeridoo. Start with chilled champagne and canapés while you watch the dipping sun turn Uluru a deep red. You’ll be taken to the highest point of the dune and seated at your table, which offers a 360 degree view of both scared landmarks. Your arrival is perfectly timed so that you see the sun disappear over the horizon, leaving a wash of color in its wake. Soon you’ll enjoy a gourmet 4-course dinner under the star-filled southern sky. Choose from a small, but creative selection of dishes, each paired with its own premium Australian wine. You’ll have plenty of opportunities to try a variety of dishes and wines. After dinner, the guide will give you a tour of the night sky and tell ancient stories of the constellations while you sip on a glass of port, cognac with native wattleseed infused hot chocolate. Tali Wiru operates from April to October. Sounds of Silence is an award winning Gourmet Australian barbecue dinner with a bush-tucker flare. Inspiring the two experiences above, this dinner will have similar elements. You’ll arrive right before sunset, listen to the sound of a didgeridoo as the sky washes with brilliant colors. You’ll enjoy wonderful dishes and quality selection of Australian wine and beer. The main difference is that you’ll help yourself to your own selection from a bush tucker inspired buffet that incorporates ingredients like crocodile, kangaroo, barramundi and quandong. You’ll sit at table with about 8 other guests and have plenty of opportunity to make new friends and take photos of the landscape before your tour of the night sky. It’s a little less fancy and a little less romantic but still one amazing dining experience. It’s also a little more affordable! Located at the budget friendly Outback Pioneer Hotel & Lodge, the Pioneer BBQ & Bar is a great laid-back eatery for people who want to socialize with other travelers and maybe meet a few of the locals. The bar can be busy in the evening, but with the live music jamming and people sitting along long trellised tables chatting away, it’s a friendly atmosphere with an unique dining experience. Head up to the counter to order your food. You’ll receive your choice of raw meat that you carry over to one of the 20 or so flat barbecues to cook up to your liking. Maybe try the Outback combo with emu sausage, beef sausage, kangaroo skewers and croc skewers. The salad bar is well stocked and it’s one of the few places on the resort that serves draft beer. Double check the menu if you order the pizza, many Americans are surprised when they receive a fresh pie loaded with a fried egg. Relaxed and informal, yet still managing to be refined and eleganct, the Iikari Restaurant is located at the Sails in the Desert. This dining spot is known for it’s amazing buffet style cuisine. It’s one of the more expensive restaurants but most of our clients end up raving about the food. There is a wide selection of food during both breakfast and dinner. Choose from fresh oysters, seafood, bush tucker and classic meat dishes made to order right in front of you. You can eat all you’d like from a huge range of side dishes, salads and desserts. The Kulata Academy Cafe is located in the Resort Town Square. Its purpose is to provide culinary and hospitality management training for trainees of Ayers Rock Resort’s National Indigenous Training Academy. There’s fresh bread and the coffee is fantastic. They make fresh sandwiches, rolls, salads and amazing shakes and desserts. It’s a great place to find a yummy and affordable breakfast or lunch while at the resort. Argnguli Grill is located at the Desert Garden Hotel and specializes in fine dining with a touch of Australian native cuisine. It’s known for it’s friendly, attentive staff and gorgeous setting. We highly recommend the tasting plates matched with wine flights. The soft shell crab starter is also amazing! Accor Plus members get 50% off a meal for two. This laid-back bar is located at Sails in the Desert. Walpa is one of the few places open after 9pm which means it’s a great place to catch a late dinner after your sunset tour in the desert. A few of our favorites here are the pumpkin and feta salad, fish and chips, or the prawns and crocodile meat laksa. It’s also a great place for lunch or just a casual drink with snacks. Those are our favorite dining experiences in Uluru. From the extravagant once-in-a-lifetime experience to the affordable quick bite, you’re sure to find something to fit your fancy on your Outback adventure. Speaking of Outback adventures, are you ready to start planning yours? Australia is an amazing diverse land known for it’s unique wildlife, the Great Barrier Reef and, of course, the Outback. Open spaces that seem to stretch on forever are steeped in the rich ancient culture of the Aboriginal people. The wide ochre landscape reflects Australia’s pioneering spirit and distinct identity. It’s truly an amazing place. There’s a little bit of outback in every state of Australia, but the most robust and well-known experiences can be found in the Northern Territory, especially the Uluru/Ayers region. This area of Australia’s Outback is truly breathtaking. Below you’ll find a collection of videos you can watch to get an idea of what a trip to Uluru might be like. We’ve done our best to create a compendium that would best impart the outback experience. Yet, images, words and video will always fail to truly convey the profound experience of Australia’s Outback. You’ll just have to see in person to truly experience its majesty. These are the places you should visit in Australia! Are you ready to plan your trip to Australia? What places are on your Australian vacation wish list? The Great Barrier Reef, our iconic Sydney Opera House and surrounding harbor, the breathtaking outback, the beautiful beaches or the luscious rainforests. These places are wonderful to visit and offer endless photo opportunities. But when they get home and return to normal life, most travelers find their most memorable moments not in ‘seeing the sights’, but in experiencing the culture. The Aboriginal arts and culture are a very unique and interesting component of the Australian identity and one that can be experienced without traveling to remote locations. You can experience the human element of Australia in intimate and authentic ways in every state and not far from where you will likely already want to visit. Save on your trip to Australia with our deals on customized Indigenous vacation packages. Aboriginal Australia is as diverse as the continent’s landscape; not one nation but many nation states speaking more than 250 languages. Each stop will provide you with a new and unique perspective and ground your tour of the infamous sites to the people of the land. You can also experience the culture by adding a few Aboriginal managed tours to your itinerary. Here are a few of our favorite places to visit in Australia to get a big dose of historic culture. The Rocks (Sydney) – Take a 90- minute leisurely urban walkabout with an Aboriginal guide in The Rocks, the historic area of Sydney’s city center. Your Aboriginal guide with show you how the ancient wisdom of Dreamtime is continuously weaved into the modern city to create a unique Australian culture. Royal Botanic Garden Sydney – The Royal Botanic Garden is a great place to learn how early Aboriginal inhabitants lived as hunters and gatherers. Intimately associated with the environment they made poisonous seeds edible, created fishing line from bark, wove leaves into mats and baskets, and much more in order to survive. During a one hour tour an Aboriginal Education Officer will help you explore the rich Aboriginal heritage of the garden and give you a first-hand perspective of the its significance. Taronga Zoo (Near Sydney) – Just short drive from the harbor you’ll find the Taronga Zoo. An Aboriginal discovery tour offers a chance to enjoy interactive experiences with unique Australian wildlife and a chance to discover more about Australia’s rich culture. An Aboriginal guide will tell you stories of Australian wildlife, the binding relationships between flora and fauna, and the Dreaming (the creation of various creatures and landscapes). You’ll also get a great photo opportunity with a Koala and ride the Sky Safari cable to discover why Taronga is known as “The Zoo with a view”. Uluru, Australia’s Red Centre (Ayers Rock) – Visiting the heart of Australia is about more than just seeing a giant red rock, it’s about experiencing the Outback; its majestic beauty, its heritage and its essence. As the traditional owners of Uluru Kata Tjuta and the surrounding land, who better to help you capture the moment than the Anangu? Unlike many of us the Anangu still possess a strong connection to the past and thousands of years of accumulated knowledge, wisdom and law. Their traditions are maintained and passed on through stories, rituals, ceremonies, songs, dances and art. There are many opportunities to experience their culture and learn more during your stay at Uluru. Here are a few Indigenous tours in Uluru. Your Vacation Planning Expert can help you select the best experiences for your trip. Sounds of Silence Dinner– A unique award-winning gourmet desert dining experience complete with a didgeridoo welcome, a beautiful Outback sunset, Australian delicacies, and a tour of the stars. Camel Ride to the Sounds of Silence Dinner site (or just around the Outback) – Camel tours of Uluru are always an amazing experience. Friendly local guides teach and tell stories about the flora and fauna, the land, the indigenous people, their own lives and the history of camels in Australia in a fun and enjoyable way. The photo opportunities are always amazing and the camels, with their own unique personalities and cheeky nature, may also provide a bit of entertainment. Tali Wiru Dinner – Another unique desert dining experience with a taste of Aboriginal heritage. This tour fills up quickly as only 20 people are allowed per night. You are taken to a large dune, well away from anything else. A majestic view of Uluru is in the distance as a local plays the didgeridoo and canapes are served as the sun sets. You will enjoy a three course meal with matching Australian wines, desert with port, and an evening of star gazing and Aboriginal stories. Desert Awakenings Tour – This tour is a great way to view the landscape and learn about its history and its people. Travelers often describe their experience as powerful and spiritual as they learn the history of the land, take in the rock paintings and learn about the local lore of the Anangu people. World Heritage Listed Daintree National Park (Pick-ups at Cairns, Beaches and Port Douglas) – This intimate tour allows you to not only learn about the Aborginal culture of the rainforest but also experience it. It’s a day full of excitement, learning, and fun. Some highlights include a smoking ceremony, mud crab hunting, a visit to your guide’s home to cook your catch, a lesson in ingenious art, and a swim in The Mossman Gorge. Mossman Gorge Centre (A quick car ride from Port Douglas) – The Mossman Gorge Centre is managed by Aboriginal natives, Kuku Yalanji, whose natural history makes them perfect guides to the oldest rainforest in the world. Your guide will provide an entertaining narrative of the unique tropical environment while demonstrating traditional plant use, identifying bush food sources, and sharing their special relationship to the land. The Mossman Gorge Centre is a wonderfully pleasant way to enjoy the rainforest as you walk along a broad walk, swim in pristine water and cross the mighty gorge on a suspension bridge. Tjapukai Aboriginal Cultural Park (About 15 minutes from Cairns Airport) – Enjoy one of the most memorable dinner and shows in the world. This performance and tour truly takes you back in history and goes a long way to bring perspective to the culture’s 40,000 year history. The food is unexpected, abundant, tastefully prepared, and absolutely beautiful. There are plenty of opportunities for photos, fireside chats with the locals and a chance to take the stage and learn a traditional dance. Bunjilaka Aboriginal Cultural Centre (Melbourne) – The word Bunjilaka is a word created from two local Aborginal languages and means “creation place”. It is a place where Victoria’s indigenous communities can express their own history within the Melbourne Museum. It’s also a place where you can understand the aboriginal history of belonging to the land on the Yarra River, populated by the Boonwurrung and Woiwurrung people before the first Europeans arrived. Royal Botanic Gardens Melbourne – The award-winning walk through the Gardens is often described as one of the most interesting walks in the city. A local Aboriginal guide takes you on a journey through the traditional camping and meeting place the for Kulin nation. You’ll experience stories, culture, plant lore, tools and ceremony. Ngilgi Cave (About 40 minutes north of Margaret River) – Not many American tourists make it out to Western Australia. If you do, it’s well worth your time to visit Wardandi and Bibbulman Country. You can experience this great landscape and the caves through the eyes of the traditional owners. Take a 3-hour private tour which includes a bush walk, a trip into the Ngilgi Cave where your Aboriginal guide will play the didgeridoo, and a live demonstration of spears and boomerangs. All of this will leave you with authentic insight into the indigenous way of life in historic Western Australia. Australia’s landscape varies from sandy beaches to rocky cliffs, from the desert outback to tropical rainforests and within each landscape is a unique historic culture, whose Dreamtime stories are as varied as the country they inhabit. A trip to Australia isn’t complete without experiencing at least a few of these ancient and mysterious cultures. View Deals or Phone us Toll Free on 1-888-3592877 (CT USA, M-F 8.30am – 5pm). What Should I Do and See During my Australia Vacation? One of the hardest aspects of planning a vacation is deciding which tours and attractions to select; especially in Australia where the options are seemingly endless! Australia is one of the most diverse countries in the world, along with one of the most popular destinations for tourists. With everything from world-class wine regions to stunning scenery to vibrant cities, the choices for what to see and do in each individual destination can become overwhelming. Don’t worry, About Australia is here to help! 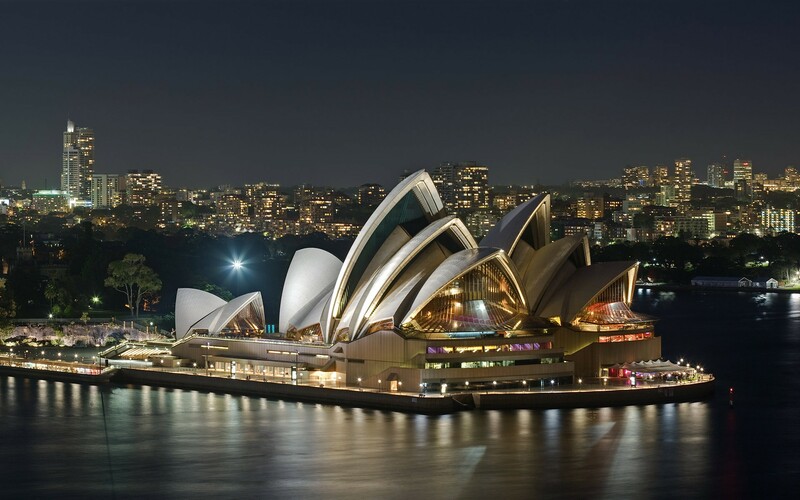 We have summarized the best tours and attractions in all of Australia’s most popular cities to make planning your Australia vacation as simple as possible. We’ve also summarized all the best wine country experiences, rainforest adventures, and more. Whether you want to plan a luxury vacation to the Great Barrier Reef or a rugged vacation in the Outback – About Australia will help you discover the very best of your chosen destination. Browse our suggestions for What to do in Australia. For even more help planning your Australia vacation, contact us, we’d love to help you!